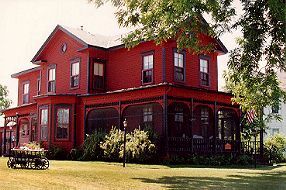 The RED GABLES INN, an 1865 restored Victorian Bed and Breakfast, invites you to share the comfort of our parlor for conversation, reading, board games or playing the piano. Guests are served twilight beverages and hors d'oeuvres in the fireside dining room or on the screened porch. All bedrooms have private baths, and air conditioning. A full buffet breakfast is provided. Guests may choose a self guided tour of the community's historic neighborhoood or a 2.5 mile River Walk meanders through the largest small-craft marina on the Mississippi. Year round activities abound in the area: Art Galleries, Antiquing, Biking, Bird Watching (Eagles and Swans), Casino, Marina (Slip Rental Docking and Launching), Canoeing, Fishing, Golfing, Hiking, Picnicking, Shopping, Swimming, Tennis Tubing, Skiing (Water, Cross-country, Downhill), Apple Orchards, Sailboat Cruises, and nearby casino. Ask about all season backpack pickniks and murder mystery weekends.